ACM@UCO assistant director Patrick Conlon was recently elected president of the Oklahoma Association of Music Schools (OAMS)! OAMS’s mission is to spread music education in Oklahoma, particularly in higher education, and Conlon will be heading the charge. 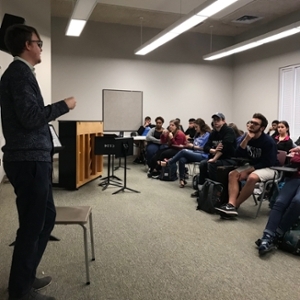 Conlon also presented a guest lecture for freshmen music majors at the University of Oklahoma on how to start a career in the music industry as a classical musician. ACM@UCO SPOTIFY PLAYLISTS NOW AVAILABLE!